The Osher Lifelong Learning Institute (OLLI) at Penn State began as the Community Academy for Lifelong Learning in 1996 and, together with Penn State Outreach and Online Education, applied for, and received, a grant to become an Osher Lifelong Learning Institute in 2006. OLLI dissolved its 501(c)(3) nonprofit status and officially became a part of Penn State in 2015. The membership organization offers affordable courses, trips, and social activities geared toward adults 50 and older. Sarah Anderson has been the director of OLLI for 11 years. She manages the program consisting of nearly 1,300 members, 350 courses annually, eight to 10 trips, as well as social and special interest groups. Born and raised in Cook, Minnesota, she moved to Duluth, Minnesota, in her senior year of high school and pursued a double-major in psychology and family studies at the University of Minnesota Duluth. She came to Penn State to earn her master’s degree in adult education in 1991. She has two grown children: Becca Benton, 23, who is in the discipleship program at The Father’s Heart Ministries Inc. in Greensburg, Pennsylvania, and Luke Benton, 20, is a sophomore at Washington State University in Pullman. 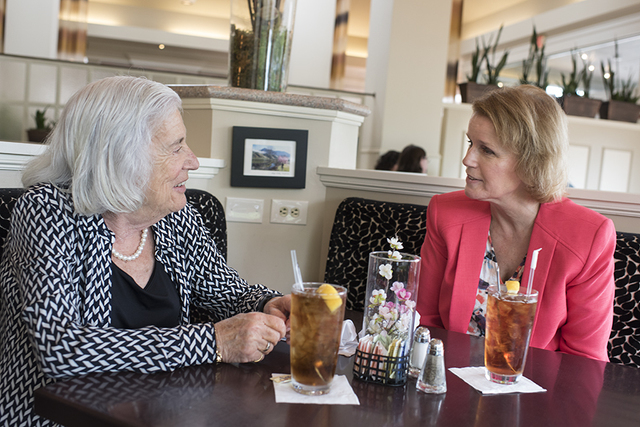 Town & Gown founder Mimi Barash Coppersmith sat down with Anderson at Harrison’s Wine Grill to discuss how OLLI got its start, some of the classes that have been offered to members, and how people can get involved in the programs. Mimi: Tell me about the origins of OLLI. Sarah: OLLI was first known as CALL – the Community Academy for Lifelong Learning. In 1996, the College of Health and Human Development had a small grant to be used to benefit seniors in an educational manner. A staff member was assigned by the dean to do some research to determine how best to use the grant funds. She found Lifelong Learning Institutes (LLI) and suggested that the funds be used to start one in State College because we were a university town. A task force consisting of both university and community members was formed. Upon learning from Elderhostel (now Road Scholar) how to start an LLI, and visiting the one at Carnegie Mellon, they were ready to launch. Mary Dupuis, a member of the task force, asked her daughter, Betsy Dupuis, a local attorney, to help their 501(c)(3). CALL launched in the spring of 1997 with a kickoff event held at The Penn Stater (then known as Scanticon). Nine courses were being offered that inaugural term and 62 people joined as members during the kickoff event. Today, we have 1,300 members, offer over 350 courses every year along with several trips and social events. Mimi: Is that too many? Sarah: No. All businesses should seek to grow and we have the good fortune of being in a vibrant retirement community that boasts a world-class university. Mimi: What's the least number of people in your classes and the most number? Sarah: It depends on the topic. Some classes are very hands-on. So, for instance, we have a bread baking class this summer, and there's only six in it, which is the enrollment limit. Yet we have a lecture-style course about Beethoven’s music that has 45 members enrolled. Mimi: What is the biggest problem you’ve run into as its director? Sarah: It's probably what a lot of volunteer-driven organizations run into, that a small percent of the people do 100 percent of the work. So, getting more people involved to volunteer their time and talents is always the greatest challenge. Mimi: So, a lot depends on the quality and quantity of volunteers. Sarah: Our volunteers are what make our organization great. They are the people who bring to us the richness of programs; they connect us with community people. Mimi: What's the strangest course you've had? Sarah: We had a gentleman from Houtzdale who taught a course called “Local Archaeology By Way of Abandoned Privy Digging.” And you know what a privy is, right? It's an outhouse. He finds old maps in libraries or historical societies to find old homesteads because people back in the day would throw their garbage down the outhouse. He would then get permission to dig on the old sites to find artifacts. Mimi: With the growth of retirement around here, people moving in from other places, has it made the organization stronger? Has it opened new doors to you? New volunteers? Sarah: Absolutely. We have partnerships with Liberty Hill, a 55-plus community, and Foxdale Village and Village Heights. They are official OLLI satellite sites. Each of those sites has a curriculum committee comprised of their residents. The committee taps into the talent from their community to teach OLLI courses at their facility. It’s a win-win situation. It benefits OLLI because we can reach more retirees where they live. This is particularly important for reaching people with mobility issues. It benefits the adult/retirement communities in that the OLLI courses bring people into their facilities who may then choose to move there one day. They can also market their community as an OLLI satellite site. Mimi: You’re in a profession where you’re helping people while you’re working. Providing opportunities for people who would not otherwise have those opportunities is a fabulous reward. Sarah: I like to tell people I have 1,300 mentors. OLLI members for the most part are quite accomplished. Because they are now retired, they are generous with their time and knowledge and they are fun and friendly while doing so. They have taken this program in directions that I would never have thought because I've not gone down their paths. I'm amazed at how many friends I've made. They are by far the best part of my job. Mimi: You’ve had a tremendous impact on the aging population of Happy Valley. To sustain a program like this and now to be affiliated with the university give it even more staying power over time. You have to feel good about the work you’ve done and are continuing to do. Sarah: I do feel very good about my work. Lifelong learning is known to contribute to healthy aging. The programs not only stimulate the mind, they bring people together which fosters friendships. I’m most surprised to hear from our volunteers, especially our volunteer instructors, how much joy they get volunteering for OLLI. Instructors often tell me that teaching for OLLI has been the highlight of their teaching careers because the participants are so enthusiastic and engaging. Some new retirees are surprised at how much they miss working. Work helps us feel relevant and important. OLLI has plenty of volunteering opportunities ranging from chairing a committee to assisting an instructor with putting together a PowerPoint presentation. Volunteers can find creative roles or operational roles. Mimi: So, OLLI links adult learners together. Sarah: They come here to learn, but the social connections are what they say they value the most. This is especially true for people new to the area or who are experiencing loss, such as retirement or the loss of a spouse through death or divorce. We all remember how fun and easy it was to make friends in school. That’s because we are learning and doing things together. When that happens, friendships form naturally. Mimi: How big is your budget? Sarah: It’s a bit over $400,000 right now. When I began it was maybe $60,000, maybe not even that. It’s been fun to watch OLLI grow throughout the years. Mimi: What can readers do to make a contribution or join? Mimi: What is your greatest need? Sarah: New instructors and new course topics. Art and history are our most popular course disciplines. You do not have to be an educator to teach for OLLI. Hobbyists or professionals can teach as well. I taught a collecting vintage costume jewelry course and the participants loved it. I didn’t have any formal teaching in vintage costume jewelry, but was a collector for over 20 years and had learned a lot from that experience. Another thing I think is important for people to know is that we may promote to people 55-plus, but anybody aged 18 or older can become a member and participate in OLLI. If you look at our classes, very few are geared toward an older person. Most of them are of interest to people of all ages. Mimi: OLLI was turned from something into a much bigger thing when we found a way to make it a partnership with the university. Sarah: Becoming a formal unit within Penn State has opened so many doors for our OLLI. It also provided a much stronger foundation from which we will continue to grow. I’m grateful President [Eric] Barron invited us to become a formal unit within Penn State Outreach and Online Education. Mimi: It’s just such a striking example of the partnership between town and gown, and how it makes a good thing better. Sarah: I’m really proud we’re part of Penn State. They’ve allowed us to continue to be community-focused and volunteer-driven. 875 OLLI members volunteered last year. Mimi: I hope Town & Gown readers will catch your passion and energy for all this in the words. Thank you so much. Sarah: I hope so too. Thank you, Mimi.